You are enabled to create pdf document for free with the product of VeryPDF—Text to PDF Converter which is the program developed for non-commercial purpose conversion from text to pdf. This application has the ability to make the conversion in batch and set several necessary parameters for created pdf documents at the same time such as encrypting pdf, manage pdf page, etc. To use the application, you need to click here to download the installer to your computer and then double click it, follow the setup wizard until you successfully install it on some location of the disk. Then please double click the application icon or open the program through Start menu. You will see the main interface of the program on your screen, which is a smart, easy-to-use one. If you want to create pdf documents without setting any parameters, please directly add text files into the application by clicking Open button on the interface or use the shortcut key Ctrl+ O combination on the keyboard to open file picker window. Then please choose all text files that you want to create pdf documents from the window and click Open button like the snapshot shown in Figure 1. You can add documents into the application in batch. Then the target files will be automatically saved into the installation folder of Text to PDF Converter after you click the button Open in the file picker window. If you want to view target file when the conversion is over, please click Menu—Open Resultant File Automatically before adding text files into the program. For learning more information about Text to PDF Converter, please click here to enter its homepage. In addition, you can also purchase the commercial license of the program for your commercial purpose. You can contact our support team if you have any questions about this program. 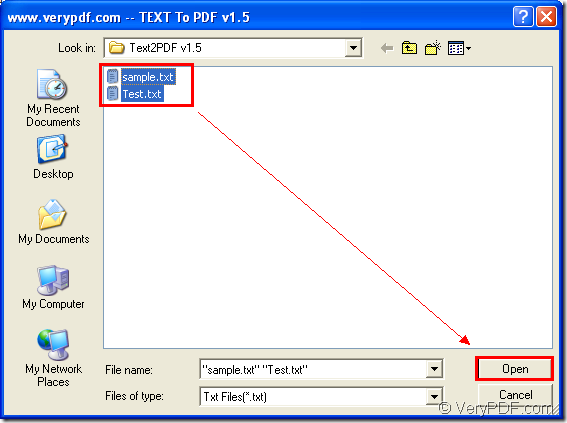 text to pdf converter, Problem appending to an existing file. This entry was posted in Text to PDF Converter and tagged create PDF, for free, text to PDF. Bookmark the permalink.